Patricia Urquiola, the famous architect of Mandarin Oriental Barcelona, is also responsible for the chattering about one of the latest uniquely-built hotels of the world – BistrEau. This lustrous restaurant with its high space and light-filled premises is famous for seafood and has become the darling of its neighborhood. It was a chapel later turned into a restaurant by the two most famous chefs Sergio Herman and Nick Bril. There is not even a single thing that was left unnoticed in this breathtaking restaurant; from the baskets to the staff uniform, everything is custom-ordered. 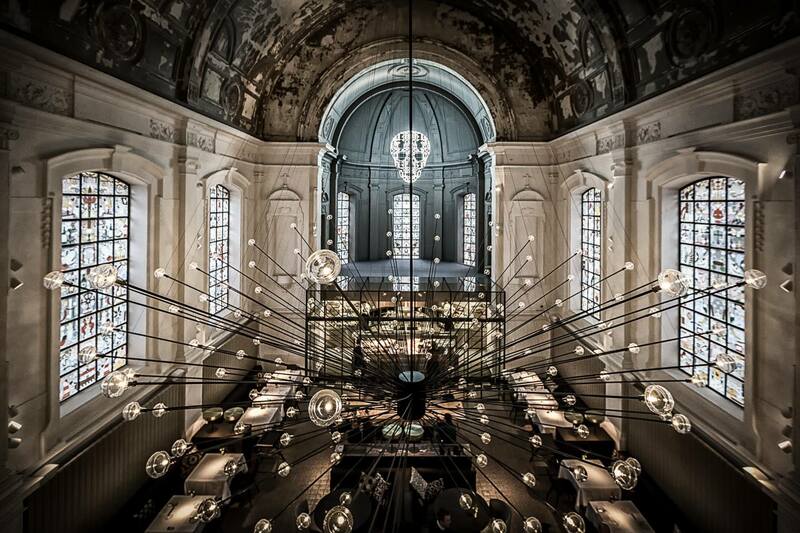 Interior designer is Dutch Piet Boon whose founding concept behind the designing is, “fine dining meets rock ‘n roll”. Some may consider it a disdain, but few changes are made to the original setting of the church. For instance, a series of glass windows are changed that now contain images of carrots, penguins, and skulls. There is also some unalloyed classiness apparent in leather sofas and velvet chairs. There is a big chandelier placed in the center with large rods and bulb on it. This restaurant has the most ultimate and forward designs of the century. Recently transformed Tate Modern and the research design studio “Mondrian London at Sea Containers” of famous Tom Dixon is also worth paying a visit. Dandelyan’s ground floor is a cocktail bar and the ornaments and settings involve seductive colors like dark green and glittering pink. There is a plenty of brass work with serpentine shapes. Sitting on velvet chairs and enjoying your drink will remind you of early 20th-century luxury cruises. The bartender of the cruise is world famous Ryan Chetiyawardana – International Bartender of 2015 – and his inspiration for bar menu were botanists. You can have drinks made from Aronia berries and pineapple skin shrub. This restaurant is by famous Stephanie Izard – a top chef winner. 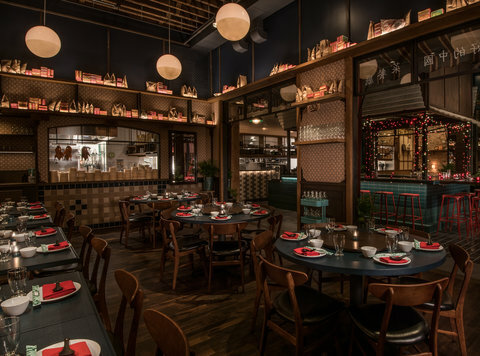 The restaurant is extremely exotic and looks like a modern Chinatown and why shouldn’t it be; it was inspired by different Chinatowns in America by the famous design firm Avroko. The restaurant looks like a theatrical space with lanterns hanging from the roofs. There are flowering patterns, multiple neon signs, paneled walls, and different blazons of red and green. The menu is fried duck, dumplings and chicken, etc. This is a conglomerate restaurant with bookstore, flower shop and perfumery and it is housed in Palermo mansion. It was designed by Stephania Kallos and Abigail Turin whose use of white and green marble, brass designing, terrazzo floor, and antique looking mirrors make this place a nostalgic 1920’s café. For seats and curtains, velour is used instead of velvet. The chef here is Pablo Massey whose ratatouille and chimichurri are most famous. The designing of this restaurant is rather like a fantasy land and gives a look of a spaceship. 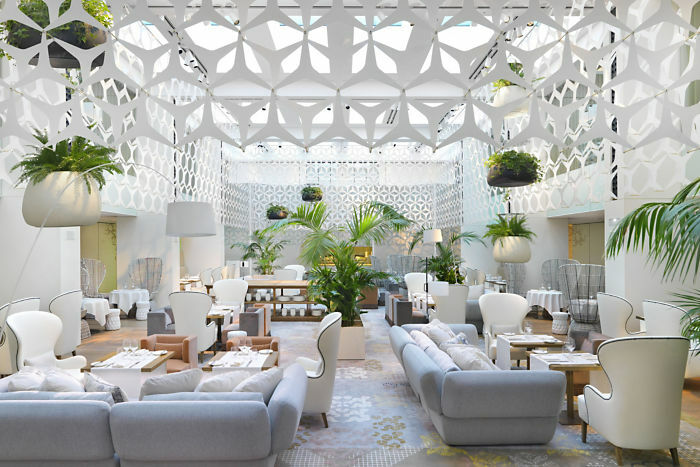 This renovated place was formerly known as Hotel Plaza Athénée and its recent renovation – this spacecraft design – resulted in winning back its third star. Most of the designing is of stainless steel, and the designers are Patrick Jouin and Sanjit Manku who used more of their imagination in creating this design rather than intellect. There are many futuristic elements like dome shaped sofas with their hard part made of stainless steel. The thing even more interesting is the reflection of ceiling chandelier in the mirror-like steel of these sofas. It was originally built in 1893 and was known as Fairmont Le Château Frontenac. It was recently renovated in 2014 by New York-based Rockwell Group. It has tall booths with blue velvet and the details like rivet and guardrails are custom-made. There is a semi-circular bar in the center with chandelier placed overhead made of metal chains that spark like jewelry.